Blogging Live from Telluride: Part 3 - Where's All the Buzz? I love film festivals. Have I mentioned that before? And with Telluride coming to an end, and Toronto about to kick off, it's time to recap my thoughts on one festival before moving on to another. Telluride is one of my favorite fests, I'll be attending every year, without a doubt. As a quick refresher, last year was the first year I attended. I got to see Slumdog Millionaire and The Good, The Bad, and The Weird and a few other great films. We all know what happened to Slumdog after, so this year there was a lot of anticipation - would we see the next Best Picture winner again? While there are some great films, I don't think there's a winner. Even Jay Fernandez at the Hollywood Reporter felt the same, saying "no one film seemed to capture the weekend's collective enthusiasm." It's not that there weren't amazing films, there certainly were, it's just that there doesn't seem to be the same amount of Oscar buzz coming out of Telluride this year than there was last year. But then again, I didn't walk out of Slumdog thinking it would win Best Picture. Hell, I recall saying it probably wouldn't even get nominated, even though I loved the movie (and saw it in Toronto for a second time). Maybe the buzz is there, it's just taking a little while to trickle out into the mainstream. Anyway, my hope is that films like Up in the Air or Un Prophete get some good awards buzz coming out of this. Oddly, two films I was expecting to gain momentum - Bright Star and Palme d'Or winner The White Ribbon - didn't seem to gain or lose any buzz, for better or worse. Then again, I didn't talk to that many people who saw either, or maybe they just didn't like them enough to remember them. My favorite films, Waking Sleeping Beauty and Un Prophete, aren't big Oscar contenders, but Up in the Air is, and I'll be rooting for it. 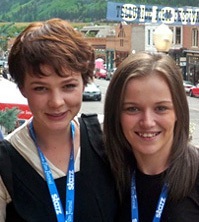 There's also Carey Mulligan (An Education) and Katie Jarvis (Fish Tank), who each had a film here, seen to the right in the photo (via indieWIRE). All-in-all I saw a total of 10 films at this year's festival and I feel completely satisfied. As I mentioned initially, I'd already seen most of the big films playing this year at Cannes, so I tried to find a few others that I really felt I might enjoy. It was also about being at the very first premiere, the very first place where all the buzz actually begins, for highly anticipated films like Jason Reitman's Up in the Air and Oren Peli's Paranormal Activity, which I know will go on to be huge. We were here at the start, surrounded by people like Leonard Maltin, Frank Marshall, Werner Herzog, and Jason Reitman. That's the Telluride experience I will always cherish. Now it's time for me to head back down from the beautiful mountains in Colorado and up north to Canada for the Toronto Film Festival next. This has been a great start to my festival tour so far and a very quick 4 days. Telluride is short, but it's a great fest, and I can't wait to come back next year! See you up in Toronto. Note: From now until October 1st I will be keeping a running tally on all the films I've seen across all three of the film festivals. You can find this list below updated in every new blog post, with links to any reviews. Hey Alex, what did you think of Life During Wartime? I have always admired Solondz for making such honest, ballsy movies. Welcome To The Dollhouse is probably my favourite of his films. Shane - It was okay... Haven't ever seen Happiness (which I heard was a lot better, and which this was an 'unofficial' sequel to), but I'm not really into Todd Solondz style. Characters were quirky and dark, but didn't really enjoy it. Kinda forgettable to me.